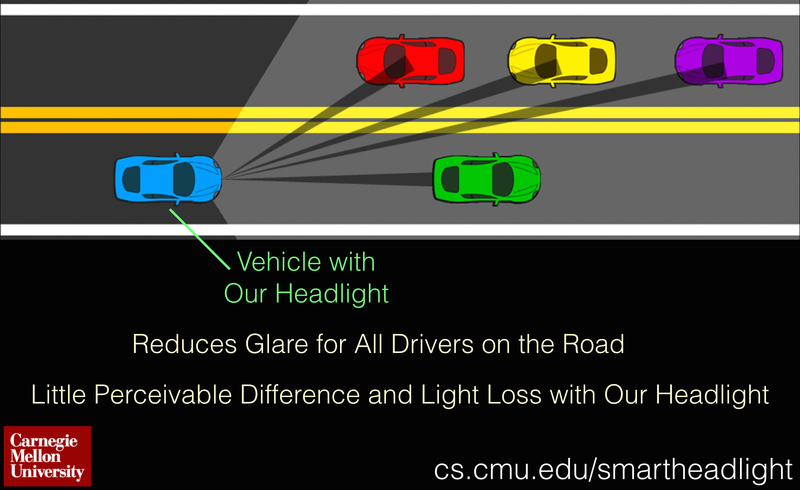 Glare from the headlights, especially high beams, of oncoming vehicles cause significant stress and distraction at best and temporary blindness at worst. Trucks and other vehicles with headlights at high positions are the worst offenders. 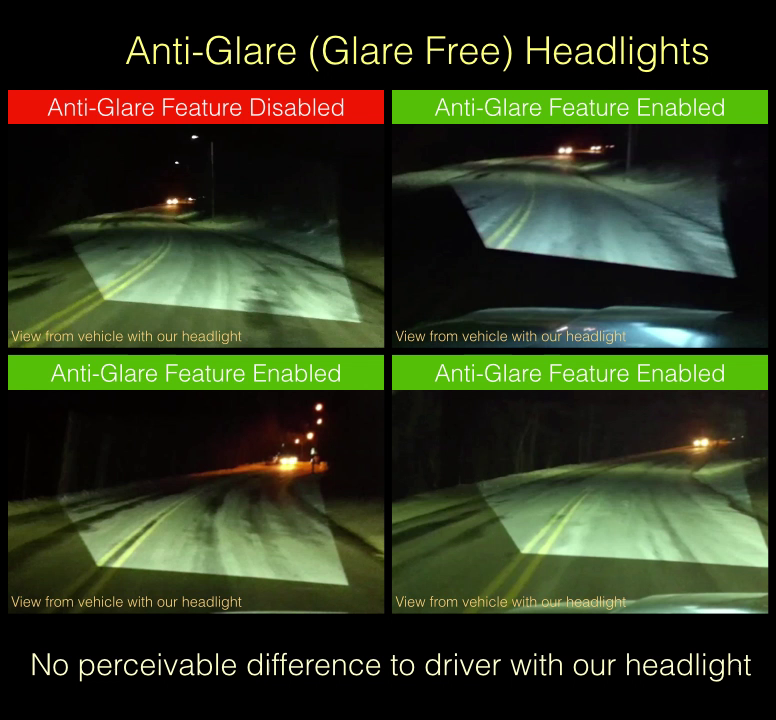 Although, glare is not often reported as a cause of accidents, hundreds of fatal night crashes attribute glare as a contributing factor every year [NHTSA report]. Glare is especially problematic for the elderly whom take eight times longer to recover from glare as compared to a 16-year old [AAA brochure]. Although high beams are a nuisance to other drivers, they are beneficial on narrow, curvy, and poorly lit roads, especially in rural areas where wildlife routinely jumps onto the road. 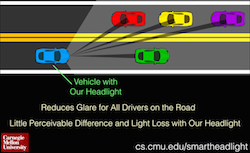 With our headlight design, the solution to this problem is straightforward -- light rays directed towards any drivers on the road can be disabled -- permitting high light throughput with little perceivable difference to drivers on the road. [direct link to illustration above]. Given the high resolution and precision of beam control (essentially an order of a million beams can be individually controlled), most of the high beam can still be on without glaring others on the road. This type of light throughput is much higher than the adaptive front lighting Matrix LED systems in market today. Concept: The programmable headlight can be controlled with such high spatiotemporal resolution that light rays directed towards any driver in any number of lanes can be disabled to prevent glare. 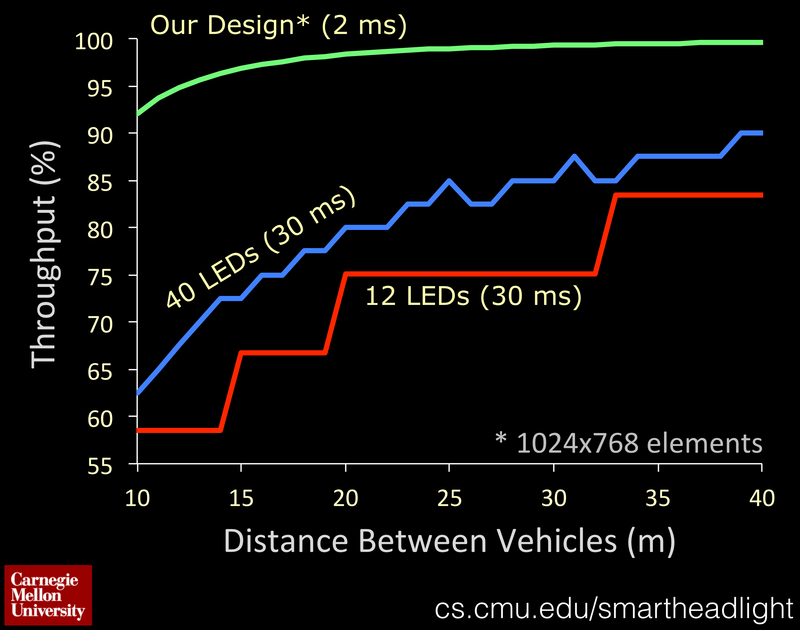 The precision and speed of our beam control is several orders of magnitude better than existing LED based headlights. 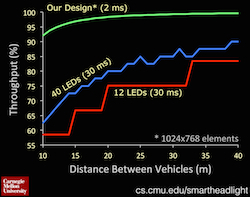 Comparison to Matrix LED Technology: Computer simulations estimate that light throughput remains above 90% with our headlight. In comparison, LED headlights (using publicly available information) lose much more light especially when vehicles are close.